Attorney General Jeff Sessions announced Monday that there are more immigration court judges than ever, a number he intends to see even further increased by the end of the year. Sessions delivered remarks before 44 new immigration judges assembled at the Virginia headquarters of the Executive Office for Immigration Review (EOIR), which oversees the immigration court system. The group, Sessions noted, was the largest class of judges in immigration court history. "I'm honored and excited to welcome the largest class of immigration judges in history—44 new immigration judges. Each of you will play a critical role in our legal system, and I have no doubt that you will be up to the task," Sessions said. The new class also means that there are more immigration judges active today than ever before. But there are still more to come, Sessions said Monday, promising a cumulative 50 percent increase in the number of immigration judges by the end of the year. The reason for this flurry of activity is Sessions' efforts to curb the overwhelming backlog of immigration court cases. Late last year, President Donald Trump temporarily mobilized hundreds of immigration court judges to help cut the number of cases pending in the backlog. The Department of Justice claimed some success in October, showing that it had addressed 2,700 more cases thanks to the surge. But recent analysis indicates the DOJ is still struggling to make a dent. There were some 700,000 cases pending as of May, according to the Transactional Records Access Clearinghouse, which attributed the phenomenon to an increase in the amount of time it takes the average case to clear. 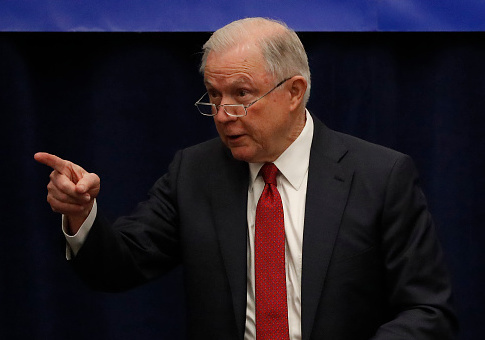 In his remarks, Sessions blamed the surging backlog on the increase in specious or false asylum claims, noting that the number of those seeking asylum who appeared in an immigration court rose from 4,000 in 2009 to 73,000 in 2016. "Our system was not designed to handle thousands of new asylum claims every month from individuals who illegally flood across the border," Sessions said. "But that is what has been happening, and it has overwhelmed the system." The attorney general also took the opportunity to defend a recent immigration court ruling, issued by his office, which restricted the eligibility for asylum. The ruling has received pushback in Congress. But from Sessions' point of view, it is part of enforcing immigration law as it exists, and keeping the borders under control. "Let me say this clearly: it is perfectly legitimate, moral, and decent for a nation to have a legal system of immigration and to enforce the system it adopts," Sessions said. "No great and prosperous nation can have both a generous welfare system and open borders. Such a policy is both radical and dangerous. It must be rejected out of hand." This entry was posted in Issues and tagged Illegal Immigration, Jeff Sessions, Justice Department. Bookmark the permalink.